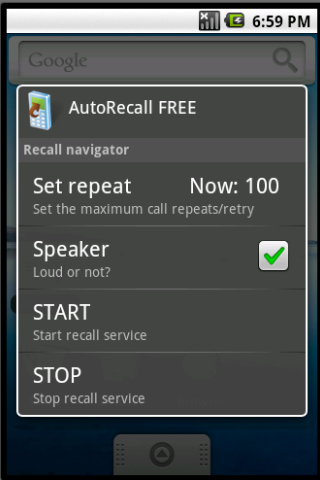 is an app that gives automatic ReDial and ReCall feature to your phone. Repeat calls automatically on busy or other call failures. Version notes can be found here. 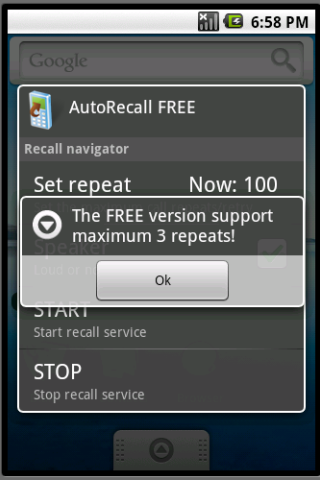 (Free version) Repeats: number of call attempts can be specified - for at most 3 attempts (cheat: 5 attempts). (Full version) Repeats: number of call attempts can be specified - for at most 9999 attempts. Debug feature: if you find a bug than make a debug log and send it to us with some info of the bug. I have Motorola Droid and the app does not cut a busy call, why? Does not work on voicemail? What is the major difference between the Full and FREE versions? Using the full version you can set unlimited call attempts. Is the full version available? Yes, go and get ift from the market if you want unlimited repeats. How can I send bugs or hint for improvement? Send us email here: zerotouchsystems@gmail.com. There many limitations of the API in this recalling approach, there is no possibility to catch phone handling button presses, restricted call start/end informaiton and so on. This is why many workarounds had to be set in order to achieve this result. 5. when a failure occurs (busy, no response) the menu reappears enabling you to interact - eg. stopping service. - Clearing call log: clears call log after each attempt - so log of previous calls will not be pushed out. - The clear call log option availability fixed (still requires payed (ticket) mode)! - Full version becomes an unlock ticket app, so from now only the free will be updated! Payed customers should use the full version only as an unlock key! - New manual dialing feature. - Bugfix: solved the conversation detection problem: so from now the service stops automatically after a successfull call. © 2010 ZeroTouchSystems. All rights reserved. Design by NodeThirtyThree.